Darwin and Denyire Lopez are a missionary couple who have been sent by their local church in Maracaibo to serve in Zamurpana, a Wayuu community of 300 people located 20 miles south of Maracaibo. Darwin shows us how to extract the pulp from the cacti. At first, the community was very skeptical of them. No one would offer them any food or water. Darwin says that sometimes all they would eat was the cacti they found around the community. Their sacrifice and effort gave fruit. Today, they have a mission church where they serve 10 families teaching them the gospel. Darwin, his wife, and daughters are working hard to learn Wayuu so that they can disciple the Wayuu in their native language. With the help of Bread of Hope, Darwin and Denyire are starting a literacy group in the Zamurpana community to help provide education for these children who are not currently enrolled in the school system. In fact, many of them, have never gone to school. Please pray for Darwin and Denyire and their family as they serve the Wayuu in Zamurpana. We continue to be amazed by the response we have gotten for this year’s mission trip. Many of you have registered to serve the Wayuu people with us in La Guajira, Colombia this summer. As a reminder, our deadline to sign up for this year’s trip is March 15th. There are only a few spots remaining before we reach our max capacity. If you want to join us there are three steps you’ll have to make before we can secure your reservation, please make sure to register by clicking on the link below, fill out your registration form, and send a check for your first deposit ($800) to our office with the memo: Mission trip payment. Here at Bread of Hope, we are gearing up for a very BIG day in the nonprofit world: this year’s #GivingTuesday. We want to make this year’s global day of philanthropy our best yet—please join the movement and help us bring the gospel to the unreached Wayuu people in Colombia and Venezuela. Amira Gonzalez is a volunteer teacher at one of our literacy groups in Maracaibo, Venezuela. She is in charge of teaching and preparing meals for the literacy group that meets Mondays, Wednesdays, and Fridays. Her class has 12 students ranging from 13 to 15 years old. Amira says that her goal is to instruct her students to not forget God’s Word. She knows that this is the age that many students fall away from the church and get distracted by the things in the world. Amira is constantly surprised at how the children have changed since attending the literacy group. The children, themselves, have openly shared or “testified” how they are now treating their parents differently and behaving more at home. This has made many parents curious and willing to attend not only the literacy group, but church services as well. Amira shares a special bond with her students. Since she is Wayuu herself, Amira has been able to overcome a lot of language and cultural barriers to reach her students. They are encouraged and challenged in their learning and pay more attention since Amira is able to teach and share with them in Wayuu. Amira wants to thank from the bottom of her heart all of her brothers and sisters in Christ who have donated or helped Bread of Hope in the United States. “We thank God for your big hearts, your lives, your offerings, and your prayers” – Amira Gonzalez. In spite of the hardships and challenges that Venezuela is currently going through, God is still moving and God is still faithful. The world around us may be dying, but HE NEVER CHANGES! This month we wanted to share with you a story about how one person’s faithfulness can impact the lives of many. This is the story of Maria. Maria Luisa Chacon, is a Christian school teacher who has her doctorate in Education. Maria works with one of our local church groups in Venezuela, coordinating a literacy program with children who live and work around the biggest outdoor market in Maracaibo. It has been a blessing to have someone with her experience. Maria has graciously donated her time training and equipping the teachers involved with this literacy program. They started this February by assessing each student individually, to see what they needed to learn. This isn’t lecture style learning. Maria is passionate and dedicated to seeing that each child actually learns how to read and write. They meet on Wednesdays and have about 70 students who come each week. 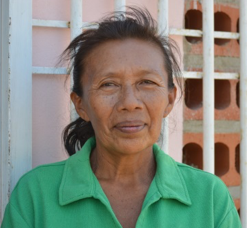 Maria’s education and years of experience have shown her that education is a science. The best way to teach literacy is to first understand how a child learns. Maria applies a method that relies on activating the neocortex of the brain that awakens a person’s memory and makes learning more accessible. They have created their own program using pictures and symbols to help students learn letters and sounds, the first steps of reading. One afternoon, a child’s mother, was paying particularly close attention to her son’s notebook. She picked up a pencil and began to write her name, amazed she told Maria that it was the first time in her life that she had ever written her name. She didn’t understand letters. As a goal these teachers hope to teach all 70 of these students how to read and write by June. But this is not just for their current future, but their eternal one as well. 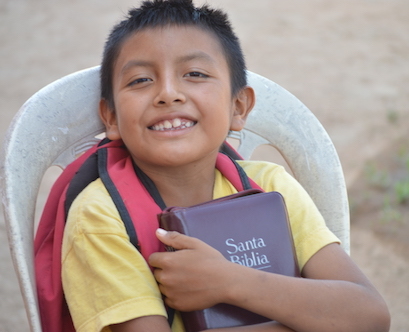 All of our literacy groups end by teaching each student how to read God’s Word. They recently received a copy of the New Testament. These teachers hope that these students will believe that Jesus Christ is their Lord and Savior and multiply the work He started in them to those around them. Would you like to help? Maria is asking for colorful books or notebooks that can be used to teach letters and sounds. From December 18th – 22nd, Bread of Hope hosted a church planters’ training for 9 Wayuu leaders. This training was the just the beginning of a year-long program with these Wayuu church planters. Our first training session centered around God’s Word. The church planters’ intensively learned how each story in the Bible (beginning in Genesis) is connected through Jesus Christ. Each story is a shadow of the Messiah, the redeemer, the chosen lamb…the Savior to come. There was so much passion and excitement amongst the students. Several times they all pleaded to skip lunch, so that they could continue learning. They were eager to hear and learn more about the Bible. This training meant a lot to these students and we were able to witness this during our closing gathering where we shared the Lord’s supper. Many of them shared in tears how they were finally able to see God’s Word as one big picture. Before training, many of them avoided teaching the Old Testament thinking that it had absolutely nothing to do with Jesus. They thought that the Bible was made up of a bunch of little stories, but never imagined that each story was part of a greater message. Many shared through their tears that for once everything finally made sense. We are excited and looking forward to our future trainings with these church planters. We know that God has great plans for them and His ministry with the Wayuu people. Please continue to keep praying for these nine men throughout the year.